♥ MULTI-PURPOSE DISPOSABLE HAND TOWELS- Made of Air-Laid Linen Paper is a cloth-like paper with greater softness and absorbency. It is also widely used in many scenarios, like parties, drying Hands, bathroom, Wiping Sink and Counter, Surfaces Cleaning and other general-purpose drying applications, especially its top quality in texture and golden vein pattern are very appropriate for formal events and wedding fete. The guests will surely have a nice and unforgettable impression on this paper. 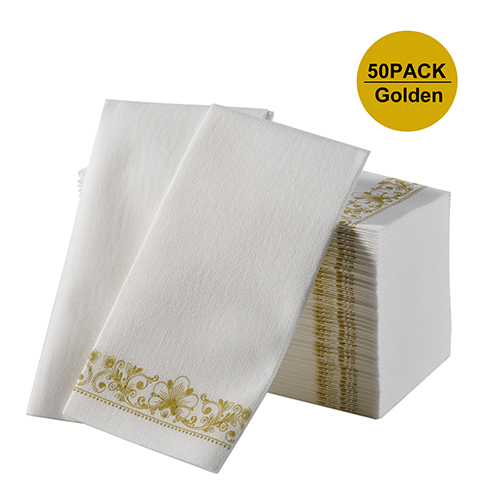 ♥ ELEGANT-EXTRA DURABLE HAND NAPKINS - Like linen elegant in texture and very soft to touch with the classic golden vein pattern designs that aim at improving the user's artistic temperament. Lower cost than linen also has disposable convenience of paper. Compared with general hand paper towels, these guest towels have a higher density and long life span even if being soaked in the water. ♥ ENVIRONMENTALLY FRIENDLY - 100% ENVIRONMENTALLY FRIENDLY MATERIAL & FDA WATER-BASED PRINT INK - Disposable Paper Towels made from 100% sterile fluff pulp and FDA Certification ink and friendly to the environment, NEVER FADE. This material features a good water and oil absorption when used in the restroom or dining table. As napkin is disposable and environmentally friendly, it is very easy to clean up the table after the party by throwing into the trash directly. ♥ 100% REFUND GUARANTEE! FULL 30 DAY MONEY-BACK GUARANTEE. If you're unsatisfied with this Guest Linen Decorative Hand Napkins for any reason, we'll immediately refund your purchase price.